He kindly answered once more our questions with the help of his translator, Isabelle Rabut, professor at the National Institute of Oriental Languages ​​and Civilizations (Inalco). The hero of the book, Yang Fei, was killed by the explosion of the kitchen in a restaurant. With very limited resources, he could not afford a burial plot, the prices of which, like real estate, increased sharply. He is forced to wander without a tomb for his eternal rest, which introduces him to many other characters who illustrate, with their deaths, flaws of modern China. Forced demolitions sometimes kill the owners, the number of victims of a fire in a shopping center is underestimated to protect the mayor. A husband is executed for the murder of his wife, mentally disturbed, who returns to the village six months later. Medical waste floating in a river, dead babies and aborted fetuses as a result of birth control policy. Other dramas are mentioned: the sale of organs and the 20,000 people who live underground, in a anti-atomic ex-shelter. Scandals, ​​several well-known events in China, but included in the novel in a non emotional style. The book has encountered no problems with censorship, but it’s not because various events or facts are known or have already been mentioned that it always guarantees a publication without incident. That’s why, if Yu Hua is critical of abuses of power by local officials, he is careful not to question the leading role of the Party. The novel was written between August 2012 and March 2013 and was released in China three months later. Public reaction has been positive and 700 000 copies were sold. By cons, very aggressive critics criticized the book for having been written too quickly, for raising well known events and therefore not to innovate and lack ambition. Caracters are considered weak and the novel is seen more as a set of short stories more or less related. Some have also criticized the lack of literary style, one feels he is reading a blog! All this has hardly moved Yu Hua, which was already confronted with “Brothers”with an outburst of criticism. In fact, the book is centered around the main character, Yang Fei, and his relationship with his father; a strong frame which structures the book and allows to cleverly introduce characters and events. Only “The Second Day”, namely the relationship between Yang Fei and his wife, has not in my opinion the quality of other days even if it stresses the rather timid character of our heroe and the strength of his wife who, after her death, will remember with happy feelings an honest husband and a peaceful life. The characters are varied, often endearing and most are not “characters” who must prove an argument or play a denunciation role. Yet a hairdresser who commits suicide because her boyfriend gave her a counterfeit iPhone 4S, announcing her suicide on QQ Messenger, you have to believe it! But sometimes reality or talent of a novelist exceeds fiction. No cruelty, no blood; when we remember the violence of the first short stories by Yu Hua, we could fear the worst. But he explained in “China in Ten Words”, how a dream about his own death allowed him to escape a nervous breakdown and control the violence of his texts. The style is very calm and sometimes quite poetic. Isabelle Rabut and Angel Pino, translators of his latest books, have done much to raise awareness and appreciation of Yu Hua in France. Some pages are very beautiful, dead babies in the trees; after her death, the dressing of the body of of Liu Mei, the hair dresser … The world of the dead seems fine when the real world is bleak and depressing! Yu Hua is not very specific about his plans for the coming months, but he did not rule out writing short stories. One of them, “Victory”, was published this summer in The New Yorker and was part of the story collection “Boy in the Twilight” published a few months ago in the USA. Publications abroad, a turning point? 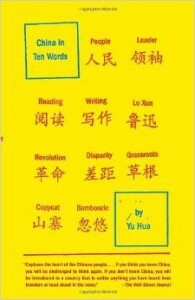 “China in Ten Words” was released in France and “The Seventh Day” was also a world premiere in translation, but the first of these books is not published in China. 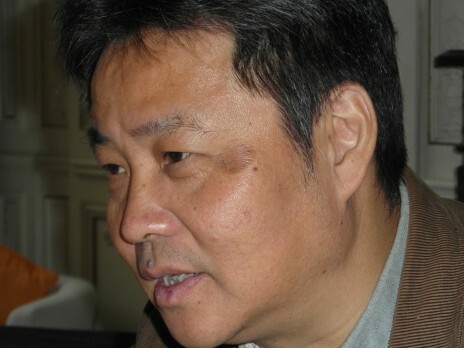 Other major writers, such as Yan Lianke, also waived publications in China (for example, “The Four Books“). 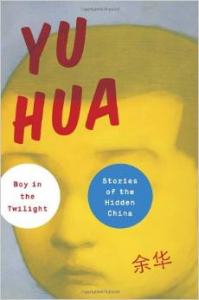 But Yu Hua is one of the few to regularly publish articles and opinions in the foreign press, and more importantly in the New York Times (translated by Alan Barr, his translator for many years). The reactions of Western readers were very positive but those of the Chinese edition of The New York Times were sometimes acid by denigrating the quality of these pieces or criticizing the author who was assuming the right to represent China (while he simply was writing a personal opinion). The tone is serious but sometimes very humorous and conclusions often sophisticated in short texts of great quality. Unfortunately his schedule will force Yu Hua to suspend these publications in the coming months. Literature and China remain priorities. 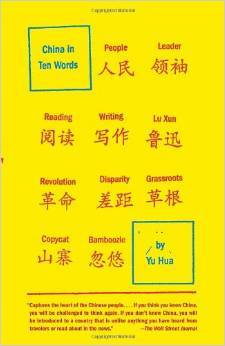 “Le septième jour” (“The Seventh Day”) by Yu Hua, translated by Angel Pino and Isabelle Rabut. ed. Actes Sud, 2014. 270 pages, 22 €.